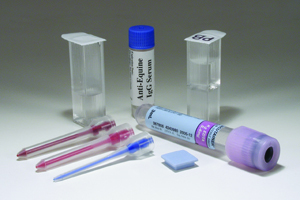 Replacement supplies for foal IgG testing are packaged and sold in a kit of ten (10) tests. Each individual test uses dilution cuvette, measurement cuvette, 2 red pipette tips, blue pipette tip, lavender 3 ml vacutainer tube, and a cap to seal the measurement cuvette. In addition, a 2 ml bottle of Anti-Equine IgG Serum is included with each kit. 591 Densimeter with the 591 Foal IgG Upgrade Kit. Please select a shipping option (below) to indicating how you want your IgG Test Supply Kit/Upgrade shipped. If ground shipping is selected for your order, your shipping charges will be adjusted to account for the additional cost of one or two day shipping.